The programs are all Chinese-taught programs. There are two PhD English taught Program–Computer Software and Technology, Curriculum and Teaching Theory. Ping An Insurance Company shall undertake the following insurance liabilities during the period of insurance, Death insurance, accidental disability insurance, Medical Insurance for Accidental Injury, Outpatient and Emergency Medical Insurance, Hospitalization and Medical Insurance. (3) Submit all your application documents by post to International Students Office before the deadline 15 March 2018. (8) Valid HSK Certificate (if available). All the documents should be bound together on top left corner in the order of( 1 )to (8). Undergraduate scholarship recipients must register for Chinese-taught credit courses. Graduate and non-degree scholarship students can register for either the Chinese-taught program or the English-taught program if applicable. 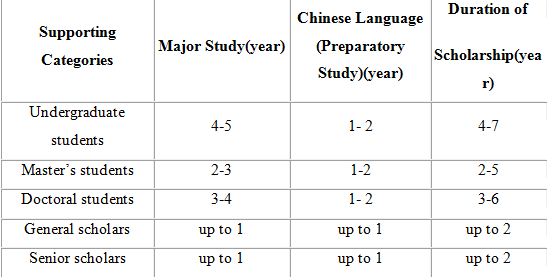 Program Search (By visiting http://www.csc.edu.cn/laihua or http://www.campuschina.org) can help you find the program and university you””re interested in. The Bilateral Program provides both full scholarships and partial scholarships. Please refer to Introduction to CGS—Coverage and Standard for details of each item. 8. Foreigner Physical Examination Form (photocopy), (written in English, only required for applicants planning to stay in China for more than 6 months, can be downloaded from http://www.csc.edu.cn/laihua or http://www.campuschina.org); The physical examinations must cover all of the items listed in the Foreigner Physical Examination Form. Incomplete forms or forms without the signature of the attending physician, or the official stamp of the hospital, or a sealed photograph of the applicant are considered as invalid. Please carefully plan your physical examination schedule as the result is valid for only 6 months. 2. Qualified applications will be sent to universities for placement. Based on various factors, such as the different scholarship funding requirements of every country, the host university”s teaching capacity, study length and applicants’ criteria, CSC reserves the right to make necessary adjustments/changes to the candidate’s host university, field of study, supporting categories and duration of scholarship. Applications enclosed with the Pre-admission Letter will be sent to the universities who issued that Letter for placement confirmation. Shaanxi Normal University International Student Scholarship is a full scholarship or a partial scholarship established by our university to enroll outstanding international students for postgraduate studies in SNNU. c. Be a master’s degree holder under the age of 40 when applying for doctoral programs. b. Submit all your application documents by post to International Students Office before the deadline May 20, 2018. This should be a minimum of 1500 words. f. Photocopy of Passport Photo Page. All the documents should be bound together on top left corner in the order of ( a )to (g).